belated Mid-Autumn Party. This year, the Lantern Festival falls on a Thursday. Unfortunately, it is not a public holiday for everyone and so no choice but to have a belated celebration on the following Saturday. I had invited over a hundred people but thank goodness not everyone showed up at the same time, otherwise my place would be a wee bit overcrowded. For those interested how a typical U.S. West Coast lifestyle is like, especially in Los Angeles, we love to entertain in our homes. It does not matter if your place is huge or not. I always say, you can always entertain a few close friends even in a closet. Others say, they live with their parents, so I countered, what's wrong with inviting your family to join in the fun? If they don't like it, they can go and watch a double-feature movie in the theatres or just sneak into another one. Others would give me cultural reasons not to. To me, it is just an excuse. For me, to entertain in one's home is to show your warmth and sincerity. What you see in the movies are either the super-rich or celebrities throwing lavish parties to impress or to get connections. In the ordinary lives of us mere mortals, the most common thing to do is a potluck. This won't put a strain on the host and there will always a great variety of food, dessert and drinks for all to enjoy. My party started at 1 p.m., we did a potluck lunch with people bringing Chinese BBQ meats, Jewish quiches, sushi, Indian samosas, lamb bryani and American staples like baked beans and corn on the cob. Even though I don't drink, there is always plenty of wine and beer flowing around. There is only a friend in the entire group who normally brings hard liquor such as vodka, whiskey etc. Of course, the Asian group preferred hot Chinese tea and most would gyrate towards coffee of any kind. There was so much to eat that we didn't have to go out or have takeout food in the evening. As night fell, more friends arrived. 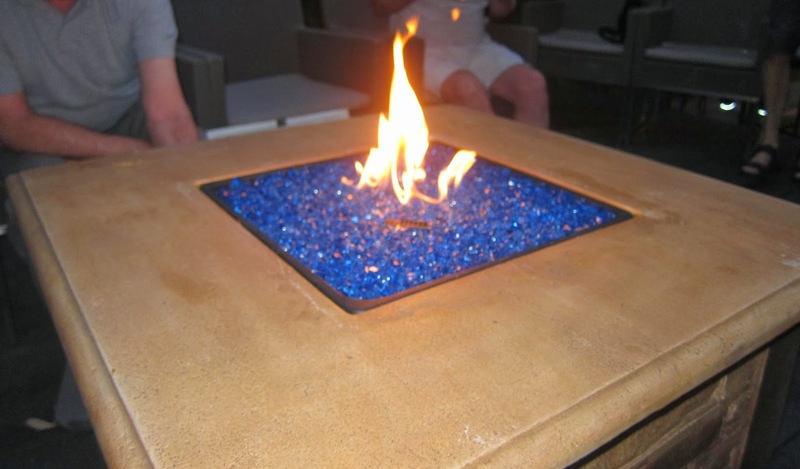 The fire pit was fired up and people gathered around it like a bunch of moths circling a light. As the social atmosphere began to mellow, everyone started enjoying the warmth and conversations became more interesting. I'm just being nice. Nothing is more salacious than gossip about people you know! That is what makes any party swing. This time around, plenty of people brought dessert. This was what I told them to bring if they intended to come later in the evening. However, they were free to choose whatever their favorites were. There was a symbolic gesture of a small box of moon cake. After all this is its festival namesake. Not many people like to eat them anyway. My new toy, the fire pit, was the main hit at the party, followed closely by another group with musical talents. They crowded around the piano. People sang and people played. Drinks continued to flow unceasingly and everyone had a great time. Thank goodness, my neighbours were also having their parties, albeit not for the same reason. So everyone is not worried about someone calling the police because of the loud noises that the neighbourhood is making. Of course, I was making the most noise. My voice boomed into the night to ensure that everything is picture perfect. I had to make sure that everyone felt welcome and had enough to eat but not too much drinking! This is because drunk driving is a serious offence in California and also I don't want my friends to get hurt or get into trouble. 玉露點秋香. Jade dew touching the fragrance of autumn. 徘徊昨夜夢. Lingering in dreams of last night. I see someone was in his poetic mood. On the surface, the poem is innocuous as can be. The "golden breeze" and "jade dew" are symbols of autumn; a poem describing an autumn scene with the poet's feelings. After a while in deep thought, I began to suspect something is amiss. "Autumn fragrance" can also be a name of a girl, especially the name of maid in this traditional Chinese story (唐伯虎點秋香) of how a flirty scholar is trying to seduce her. Oh ho! Crouched in poetic imagery, is my friend trying to brag about his last night's conquest? But before I could go further, another chimed in a poem of his own. 夏花無限嬌. Unlimited is the beauty of summer flowers. 秋雪豈能有, How can there be snow in autumn? 冬月醉長夜. The winter's moon, drunk in the night. 明日水東流. Gone tomorrow, like the waters flowing east. For a long time, there was silence in the air except the creaking of the rockers. For a long time I wondered why the mood had changed even though I detected a euphemism of brothel in the last poem. Finally 2 a.m. approached and everyone started to get up giving the excuse that it was time to part and thanked me for a wonderful party. I was tired too and called it a night. The next day, I recalled last night's poems and began to write them down. As I was translating the poem, suddenly from the written form, I found the answer to my last night's question. Reading the first two columns from left to right and from the top to bottom, the characters from the first four lines form two Chinese phrases, "Spring, Summer, Autumn and Winter" and "Wind, Flower, Snow Moon". The first phrase is just a description of the seasons of the year but in Chinese can symbolically mean the four stages of a person's life; his youth, his peak, his declining years and his final days. The second phrase originally meant the poetic beauty of nature. However, now degenerates to a description of having a dissolute life of wine and women! No wonder last night's atmosphere abruptly changed. I am sure one of my friend was laughing at the age of the bragger. I guess those two won't be seeing each other for quite a while. Jeff, Jeff, Jeff… You are too slow in catching on things of this calibre. Now you know the reason of this notebook entry.